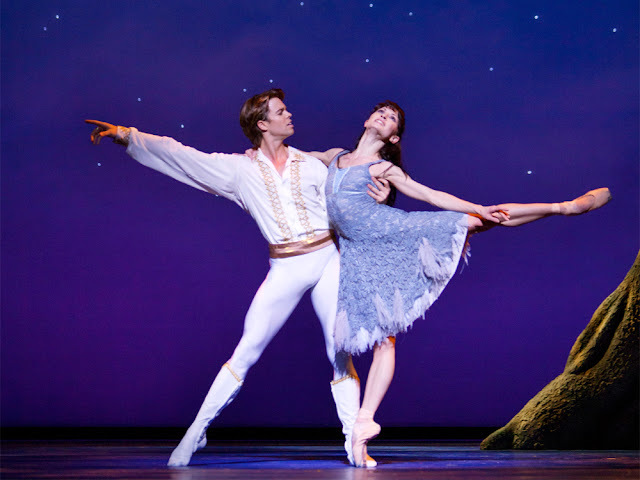 Earlier this week I attended the opening night of Christopher Wheeldon's modern production of Cinderella, performed by the Dutch National Ballet in association with Sadler's Wells. The British choreographer's fresh approach to the 19th century classic is accompanied by Prokofiev's dramatic score performed by the Royal Ballet Sinfonia and wonderful set design and costumes by Julian Crouch. 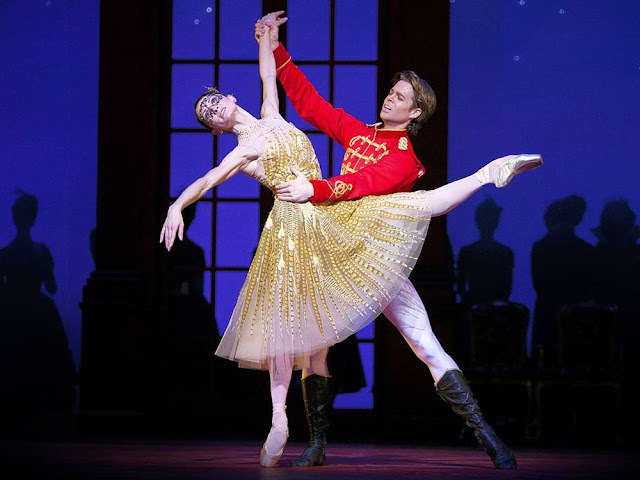 Wheeldon wanted to create an innovative version with twists and more substance than the traditional fairytale so it's a Cinderella like no other: there's no fairy godmother, mice footmen or pumpkin carriage. Focusing on some of the darkness in Prokofiev's music and the dark themes of the Brothers Grimm version, this adaptation is a little more serious and grown up. Another way in which this interpretation is modernised is with the unique projections, beaming moving leaves onto the giant tree, projecting old portrait photography onto the walls of the royal palace and moving clouds in the spectacular carriage scene, with the heroine lifted into the sky atop galloping horses and wheels made of branches with a peach parachute silk dress billowing behind her, which brought the curtain down on Act I. Such a striking visual with a climactic score, I goosebumped. The theme of nature runs throughout, starting with the tree which sprouts from Cinderella's tears at her mother's grave to the mythical seasonal fairies. Another favourite scene was featuring the Spirits of Lightness, Generosity, Mystery and Fluidity, taking it in turns to burst onto stage in colourful costumes with sparkling tulle in bright green, golden yellow, deep brown and icy blue to represent the seasons, offering guidance to Cinderella. Another highlight was, of course, the ballroom scene where the charismatic Prince and Cinderella dance, kiss and fall in love. It's a romantic pas de deux, made even more so as the two leads Anna Tsygankova and Matthew Golding are partners in real life too. Tsygankova makes a beautiful Cinderella with her graceful, expressive movement, swirling around the stage in cornflower blue lace or golden yellow dress made with bird feathers. It's a fresh production with elegant choreography, gorgeous costumes and stunning set design which makes for an enchanting evening.